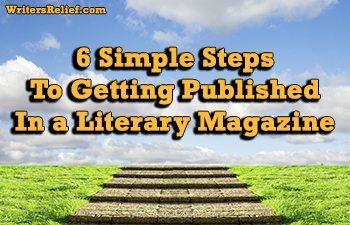 Publish Short Stories - Writer's Relief, Inc.
Getting your writing published in literary magazines (aka literary journals) isn’t easy. It can take months (maybe years!) of preparing the writing submission that can earn your first acceptance letter from a lit mag editor. But the effort is worth it. Literary journal publishing credits can enhance a writer’s career in countless ways. 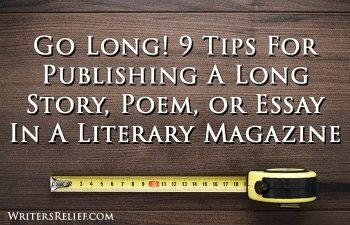 Here are just a few of the many benefits of lit mag publishing! It establishes that there’s an audience for your writing. When you get an acceptance letter from a lit mag editor, it means people are interested in reading your work. Not only does the editor in question love your submission enough to publish it, but he or she thinks readers will enjoy it as well. It proves you can write. Sure, you know you can write. But publishing credits go a long way toward actually proving it, especially in your author bio. It’s great exposure. If you’re working on building a reputation as a writer, you’ve got to get your writing in front of your audience. 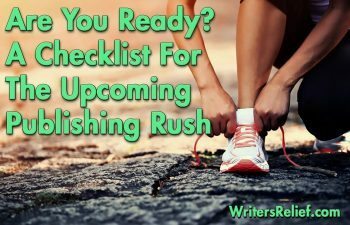 It’s great for building your larger author platform. Your author platform is your aggregate reputation as a writer across many platforms (from social media to library shelves). When you publish in a lit mag, you can link readers to your story/poem/essay via your social media sites and your author website. It looks great on a résumé. When you’re applying for a job, having a few great publishing credits can make you an intriguing and impressive candidate. And if you’re hoping to teach at the college level or apply for a post-grad degree in writing, publishing credits are a must. It confirms that you know something about the publishing industry. The fact that you were able to get published means you understand how the industry works. Publishing pros know how hard it is to get one single publication credit—especially that first one. Having been published in a lit mag suggests you’ve learned how the game works and you’re ready to play. Literary agents (and other publishing pros) read lit mags. Since the days when we first started helping authors back in 1994, we’ve seen a number of Writer’s Relief clients approached by literary agents who read their work in lit mags and wanted to talk about representation possibilities. You could win a contest you didn’t even enter. Yep, this has happened to our clients as well. Some literary journals automatically enter the writers they’ve published in their open-to-the-public contests (sans entry fee!). It can help you publish a collection of stories or poems. 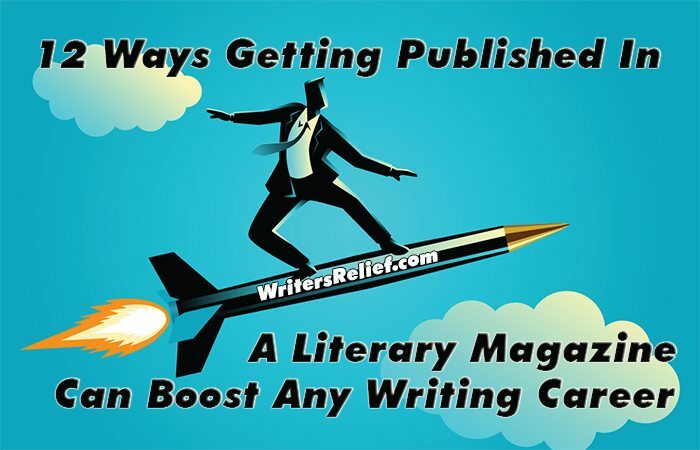 In fact, publishing your pieces in lit mags is a MUST if you’re hoping for a book deal for your collection of short stories or a collection of poetry. It looks great in a query letter. Agents love to see writers published in literary journals for all of the reasons above, and more. It suggests you’re on your way up. By working hard and expanding your author bio to include publishing credits from literary magazines, you’ll demonstrate that you’re a dedicated writer who just might be the next name on everybody’s lips. It can put you in the right place at the right time. Lit mag publishing credits have led our clients not only to agent representation and contributed to book deals—they’ve also led to invitations to speak, teach, and read in public forums. You never know who might read your writing in a literary magazine. Don’t Have Any Publishing Credits From A Literary Magazine? Don’t Worry! 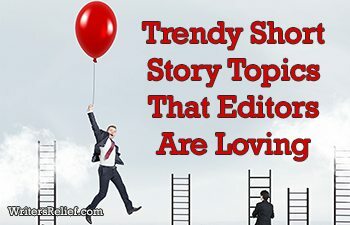 In spite of the myths you’ll hear from embittered naysayers (like the old “you have to be published to get published” routine), editors genuinely love publishing new voices and take personal pride in being the first to introduce a talented voice to the world. All writers are unpublished writers at some point. If you want to demonstrate that you’re serious about your craft, but you don’t have any publishing credits yet, here are some things to consider when writing your author bio. QUESTION: Have you been published in a literary magazine? Post the name of your work and the publisher’s name in our comments section. Links welcome too!